Why should you order your own Recipe Cards? BONUS - The 4x6 recipe cards size of the card provides much more room to write your recipes on rather than a 3.5x5 size. PLUS, the back is left blank for you to write additional notes and directions! Use them as cookie recipe cards, recipe index cards, decorative recipe cards, holiday recipe cards, cupcake recipe cards, wedding recipe cards and More! Why choose Hadley Design's Recipe Cards? · Hadley Design's Recipe Cards are a customer favorite! · They are unique and different from the mass produced recipe cards. · It's the personal touch that make Hadley Designs recipe cards special. · Each recipe card is handcrafted on heavy-weight extra smooth stock. Props in picture are NOT INCLUDED such as: Towels, Measuring spoons, Flowers, Wooden Spoon, Twine, Pen, Measuring cups, ETC. SAVE MONEY - Only $.25 per card! Compare it to other sets that cost $.40 per card!!! 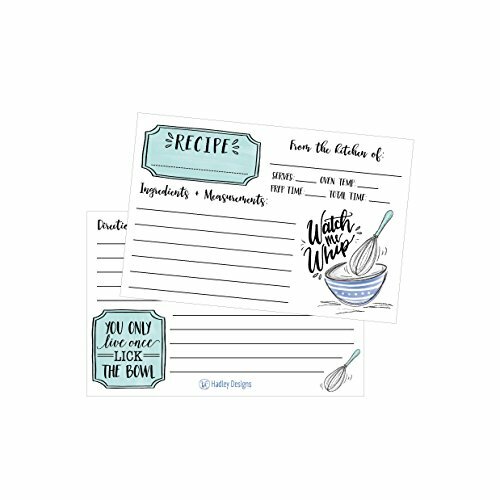 EASY TO WRITE ON - Thick high quality cardstock makes them easy to write on compared to other recipe cards that are printed with a gloss finish. Order now to see the difference thick cardstock can make! LONG LASTING DURABILITY - These recipe cards are thick and can hold their own around the messiest recipes. The cards will last for years! LOVE THE DESIGN & QUALITY OF THE RECIPE CARDS OR YOUR MONEY BACK!